Since the time immemorial, Indian Weddings have remained an alluring event. The traditions and rituals, which are essence of an Indian wedding, are quite fascinating, but the ways an Indian wedding is conducted and executed have changed with the passage of time. The contemporary styles have been replacing traditional wedding arrangements and there is an increasing trend of consulting and hiring event and wedding planners. While marriage remains an important event, modifications and additions in set-up and ingenious mandap and wedding decoration ideas can further enhance one’s wedding ceremony. Traditional wedding style is getting obsolete now. Couples now demand newness in their weddings instead of stereotypical mandap decorations and conventional arrangements. The old-style red and golden settings are being replaced by new color combinations, floral decorations, and vibrant themes. With exception of bridal attire, Indian weddings have not remained the same. The trend of outdoor Indian wedding is also on rise, which further paves way for a couple to bring uniqueness and beauty in their wedding by utilizing natural surroundings. A journey from aisle to Mandap changes bride’s life forever. Shouldn’t this passage be special? 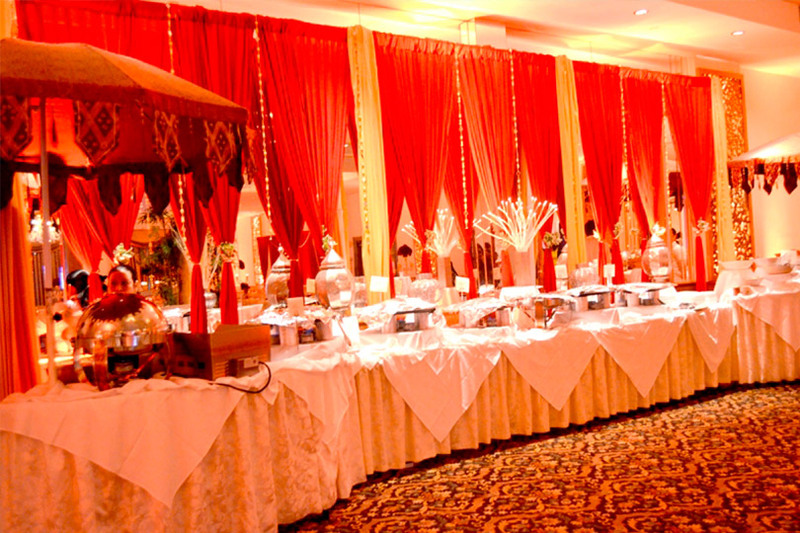 The old-style Indian weddings have always used plain red carpets and runners which have become very common now. They aren’t distinctive anymore. Instead, bride dreams of walking on a path covered with flowers of her choice or which match to her dress. This doesn’t only fulfill her desire, but also adds remarkability in the wedding. A traditional mandap is decorated with ‘matka’ pillars and red drapes. Choices may vary, but a revolutionized Mandap accommodates more style, color combination, space, decoration and seating arrangement. Couples now prefer peach, purple, and pink shades for their Mandap with the combination of white or cream color. Instead of matka pillars, drapes of chiffon are used on all four sides of the stage. Else, the flower decorations or candles are placed on all four corners of the Mandap. Similarly, open Mandaps are now getting conventional. The mandaps today are covered with flowery top to enhance the ambience and the outlook of the stage. Moreover, simple stools for bride and groom have been replaced by well-designed seats of different styles. The seats range from Mughal style to assorted ones. When seating arrangement compliments with Mandap decorations, it adds more beauty to the wedding. Again, the red seat covers are completely outdated now as couples now choose other color combinations for this purpose. Also, the tables for guests are now decorated with beautiful and innovative centerpieces, which not only improve the outlook of a table, but create a great impact in the wedding. A huge variety of centerpieces is available now including vases, mosaic centers, crystal balls, etc. Weddings take place almost every day, but a distinctive and different wedding becomes a memory. In order to make your wedding distinctive, it is best to follow modern trends and incorporate creative and latest decoration ideas. Glamorous Event Planners offers great wedding decoration ideasto make your wedding splendid.